Anyone have any details or have tested it???? Since the cat is out of the bag I'll have to say that I have been experimenting with it myself. Results so far are pretty darn cool. Still doing wash tests. Heat on the press needs to be backed down to 265 degrees F with very light pressure. 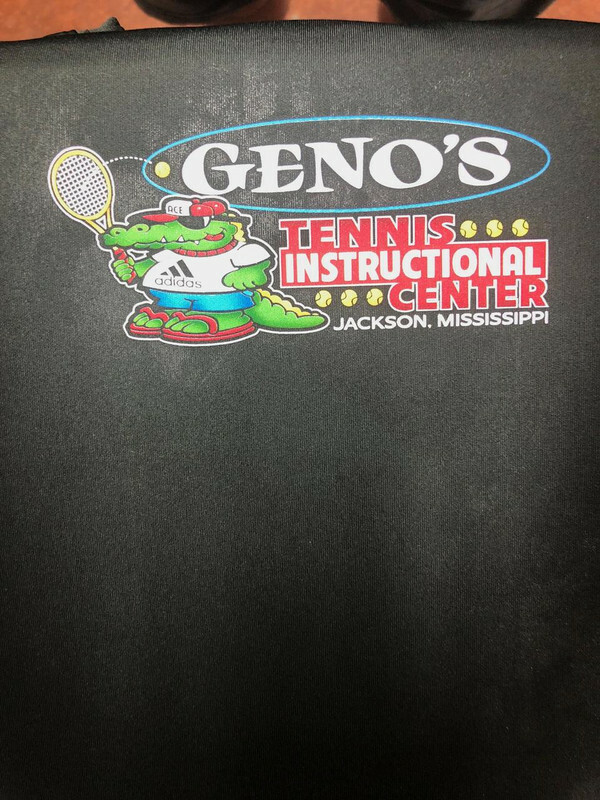 Here is my very first print with the poly pre-treatment on an A4 100% poly dri-fit tee found at Staton Wholesale. The poly pre-treatment is a little thicker than regular cotton pre-treatment so for me I had to dilute it some what to get it to go through my Speed Treater nicely. Still playing with that part of it. Here is my second shirt that I printed on a red 100% poly dri-fit. Had a little fun with the artwork. Sample tee only. Depending on the brand some poly tees are tightly woven and some are not. For the ones that are not you'll leave a bit of ink on th platten that must be wiped off after every print. The A4 was a tight weave so I didn't have that problem. Tee #3. Overhead light reflection with the iphone was giving me grief. You can also see that I had a little too much pretreatment on this tee. Still printed great and it all washed out though. Print held up well too. 30 grams of poly pretreatment for a full size print is Epson's recommendation. Ratio to water is 1:0 on darks (straight out of the bottle), 1:6 on lights. Still playing with that too. Last edited by gatorGRAFIX; October 18th, 2018 at 02:27 PM.. I figured you might be the one. :-) That was my main question, does it work for dri-fit. That is the biggest request we get. Looking forward to giving it a try. As I get more time to experiment and get it just right for my own satisfaction I'll post more results. Been very very very busy the last two weeks so my time has been a bit limited the last couple of weeks. The trick that I see is in the curing (heat pressing) and how much or how little ink that you lay down. I like to hover dry first but that's just me. Always scared of smearing heavy deposits of wet white ink when pressing so this eliminates that. You also don't want to lay down too much pretreatment because it will give a stiff feel to the touch. It will take a little practice to get it just right but it will happen. Once I get the viscosity formula for my Speed Treater dialed in I should be getting even better results. Epson recommends the highest quality ink settings for maximum coverage. Especially for the white. I found this to be pretty much true. 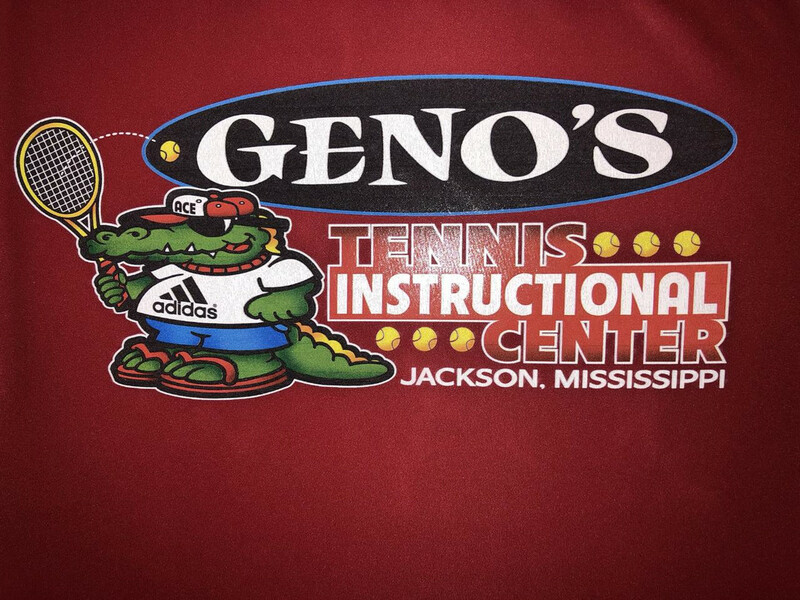 Last edited by gatorGRAFIX; October 18th, 2018 at 02:08 PM..
Is this all-purpose, works on cotton? Or do you need 2 speed treaters? No need for two Speed Treaters, you just swap out the jugs but I did do a water flush before and after I used it. Easy to do. Two clean empty plastic one gallon milk jugs, one with water, one with out. Place the IN hose in the water filled jug and the OUT hose in the empty jug. Flush with water for about a three count and you are ready to use the poly pre-treatment. Just reverse the process when you want to go back to cotton printing. Takes no time at all hardly. It is not all-purpose though. Poly printing only. You'll notice that Epson recommends a +100 on the white ink density. That is another aspect that I am playing with. This is supposedly to "fill the gaps" on loosely knitted poly tees. Again, the A4 tees that I printed were very tightly woven so I have some room to experiment on this point. I cannot wait to try this on some poly caps too! Last edited by gatorGRAFIX; October 19th, 2018 at 08:28 AM..
What about blends? Which pretreater? I would use this for blends myself. Printing those with cotton pretreatment is always a crap shoot. Which pretreat sprayer you guys use? They seem so overpriced for such a simple machine function.. Spraying a single fluid thru a tiny nozzle! 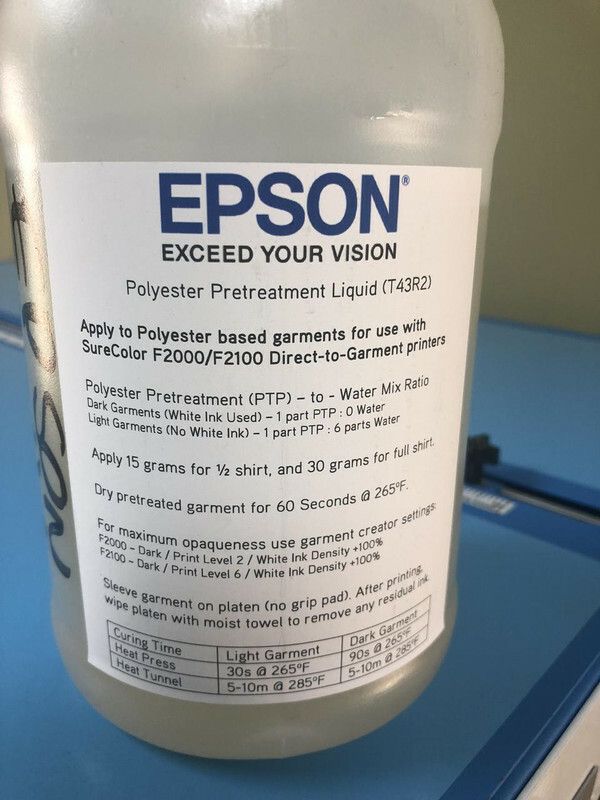 You will need to use a higher end automatic pretreater to achieve good spray results with the new Epson polyester pretreat due to it's thicker viscosity. Straight from the Epson horse's mouth. For dark shirts (white ink used)*- use the pretreatment without diluting. For light shirts (no white ink) - Dilute with*1 part pretreatment to 6 parts water. The polyester pretreatment should be applied by a sprayer (SpeedTreater works great). Amount of pretreatment to applied: 15 grams for a*1/2 Shirt / 30g for a full shirt. *Please note that the pretreatment does have a higher viscosity, so the spray width will be a little narrower than the cotton pretreatment. *On my machine it looks like the nozzle sprays*about 14.5-15" wide which isn't a problem since I'm using a 14" wide printer platen. As for the speed setting, I'm at a*7 and it seems OK but a bit heavy on coverage. With the heatpress, use a temperature of 130C / 265F and press for 60 seconds. You should only need light pressure (~4psi) to flatten the garment fibers. 1	Don't use a platen with*the grip pad. Ink will likely penetrate the garment and leave residue on the platen. This can be cleaned up with a dry paper towel, or using a slightly damp towel if heavily soiled. Do not use cleaner with*Alcohol (i.e. glass cleaner, windex, rubbing alcohol). If cleaner is needed, use only a sparing amount*of printer maintenance fluid. a	Many polyester garments have loose threads to allow greater wicking of sweat. Hold the garment up in front of a light and you'll most likely see the light coming through the garment between the fibers. When the ink is applied, it will stick to the garment but will also go through the space between the fibers. 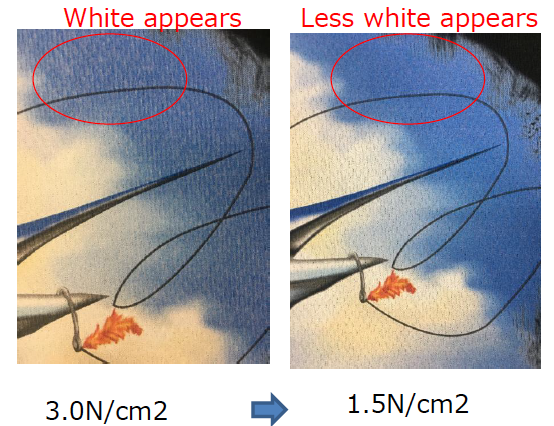 This is why we are pushing the white ink to the maximum, why there will be residual ink on the platen after printing, and also why we are recommending sleeving the garment. With a heat press, use a temperature of 130C/265F and press for 90 seconds (Dark) / 30 seconds (Light) with little to no pressure. If using a heat tunnel, bump the heat up to 140C/285F and allow about 5*minutes to cure. Time will vary on the type of heat tunnel. The Epson UltraChrome DG inks can achieve a "5" on the AATCC 2A test when used on Cotton. The Polyester does well, but preliminary results are a "4-5" which is still considered the life of the garment. *With typical t-shirt style*graphics that have solid colors, the ink will stay put for a long time. If there are very light coverage areas (below*10%), then there may be accelerated fading. 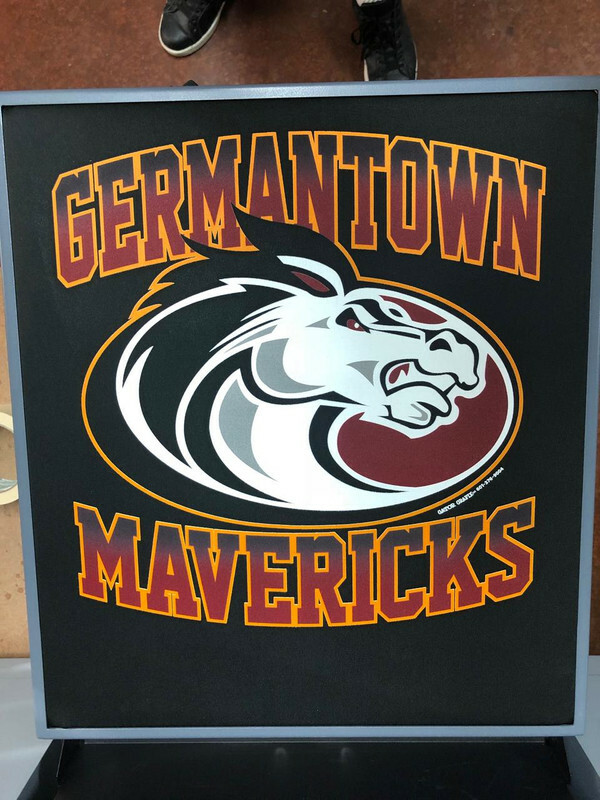 Unlike screen printing that has a thick layer of ink applied, the amount of ink applied with DTG is much lower. 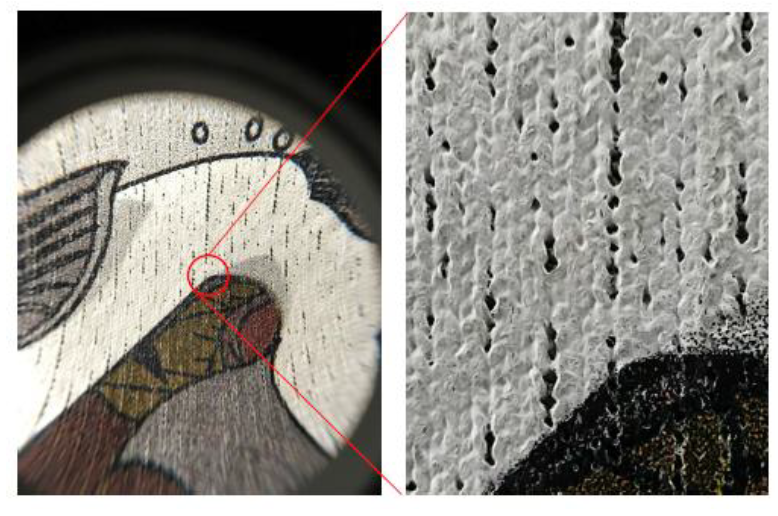 The ink will cling to the fabric surface, but as the ink falls into the voids between the fibers it creates a “cracked” look (see below). This can be improved by increasing the amount of white ink being used (Level 6 with +100% ink duty). If there is a significant amount of ink going through the garment, this can be improved by a applying a higher level of pretreatment. When cured, this will create a less porous print surface. If the print looks good on the printer, but has the “cracks” after curing take a look at the heat press pressure. When pressure is applied, it slightly stretches the fabric and causes the fibers to pull apart which creates a “crack”. Lowering the press pressure will help, or completely eliminate the pressure with non-contact heat (tunnel). The polyester pretreatment liquid is thicker than the cotton pretreatment. It is intended to be used at 1-parts pretreatment to 0-parts water. In general, diluting the pretreatment will result in duller colors but better wash fastness. When asked about diluting the solution to a 3-parts pretreatment to 1-part water (75/25 mix), the engineers at Epson felt that slight dilution will have only limited influence. The slightly diluted liquid should flow better through the sprayer. If you print a light layer (4 pass) of white ink before printing the image it makes a big differences. Equipment Zone will have the new Epson cotton pretreatment in stock next week. The new Epson dark polyester pretreatment should be available towards the end of December. This is a discussion about New Epson Pretreat for Polyester that was posted in the Epson SureColor DTG Printers section of the forums.